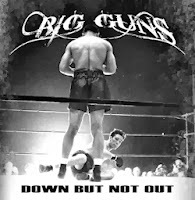 RockUnitedReviews: BIG GUNS - "Down But Not Out"
BIG GUNS - "Down But Not Out"
To be honest, "Down But Not Out" feels a little light, as there's only eight tracks and one of those is a pedestrian retread of Neil Young's "Rocking In The Free World", a song that certainly doesn't need yet another boringly faithful cover version. Elsewhere, Big Guns certainly aren't boring, as there's plenty of evidence of a real fire in their collective bellies. Oddly, they fall between AC/DC and Airbourne in their sound, taking the basic concept of the old boys and mixing it with the adrenaline of the newer lads. There's nothing to get too excited about, but what they do, they do well. Vocalist Kieran McArdle has a very strong, throaty voice that is just built for hard rock, whilst Daniel O'toole does a fine job on guitar, and on this evidence I'd love to see what they can do in front of an audience. Oddly, the album ends on an instrumental called "Forever & Always", which is rather slow and more like an "outro", which has the effect of making the listener go "is that it?" rather than "I want more". If they had cut the instrumental and the cover version this would be on it;s way to an RRRR rating, but in it's current form it just feels like it's been a bit rushed, although it's still a solid piece of work in the main. Michael MONROE: "Horns and Halos"
ORPHANED LAND: "All Is One"
MY ENDLESS WISHES: "My Endless Wishes"
HAREM SCAREM: "Mood Swings II"
CRYSTAL PALACE: "The Systems Of Events"
CLAYMORDS: "Scum Of The Earth"
REDRUM: "Victims Of Our Circumstances"
Jesse DAMON: "Temptation In The Garden Of Eve"
LITTLE RIVER BAND: "Cuts Like A Diamond"
TARJA: "Colours In The Dark"
DION BAYMAN: "Smoke and Mirrors"
LOVEBLAST: "Hard Liquor In Big Glasses"
GORTHAUR'S WRATH: "War For Heaven"
The JOKERS: "Rock N Roll Is Alive"
BLACKMORE'S NIGHT: "Dancer and The Moon"
James CHRISTIAN: "Lay It All On Me"
Brett WALKER: "Straight Jacket Vacation"
ARC ANGEL - "Harlequins Of Light"
Fergie FREDERIKSEN: "Any Given Moment"